Series 17 and 18 of the Marvel Minimates both showed up on the same day, and both were based on Spider-Man 3. I cherry-picked which sets I wanted, but I still ended up with more black-suited Spider-Men than any sane person would need. This version is skinnier than the one we reviewed last week, but he's mostly identical: the paint is the same and it still goes all the way around his body. The big difference? His unmasked head. He gets a new hair piece with a stylish brown wave (not the emo curtain he had while wearing this suit in the movie) and a perfectly Peterish smile on his face. If that wasn't enough, he also comes with a new piece that no Spider-Man has ever had before: a half-mask that covers his eyes, but leaves his mouth exposed. You know, the classic "kiss" mask. Not that he wore it like that when he was in black, but it would be nice to see this repainted in red and put on a normal Spidey at some point. UBSSM is paired in this set with Gwen Stacy. 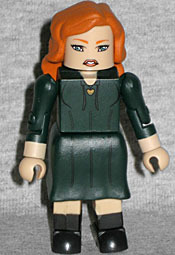 Blonde Gwen was played by natural redhead Bryce Dallas Howard, and the figure's face has... a so-so likeness of her. You can recognize her if you're looking for it, but she doesn't scream "Bryce." 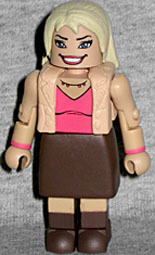 This figure represents Gwen as she appeared at the Spider-Man Day celebration: a tan jacket, pink shirt and flower-print skirt; of course, the Minimate has a peach jacket, pink shirt and plain brown skirt, so the design isn't perfect. Her hair is a new piece (accurate to the film), as is her jacket. Her very fancy jacket. She's not wearing any underwear, which fits with Gwen's party girl personality. This set was the one in Series 18 to come with a variant, and it's Gwen that gets replaced. While both sets have the same Spider-Man, the variant comes with the real love of his life, Mary Jane. Her outfit is based on the same scene as Gwen's outfit, but it's such a dark green that you can barely make out the small black details used for the pattern and her anatomy. Even the heart necklace is nearly invisible. She has an odd expression on her face - maybe she's supposed to be upset, or worried or surprised, but she doesn't look good. Doesn't look much like Kirsten Dunst, either. Her hair is new, too, and in a reversal from the Bryce Dallas Howard situation, Dunst is a natural blonde who's playing a redhead. Since Minimate bodies are interchangeable, you can put a plain black Spider-head on this body to get rid of the half-mask look if you so decide. Me, I don't really care, because I bought these sets to get the girls and add some more civilians to the ranks.